Everybody benefits from a good cycling infrastructure. This is where you find out why. because you are flexible: you do not have to wait for trains, which sometimes can be cancelled – with a bike you can travel from door to door, without wasting time looking for a parking space. because it is fun – as long as the infrastructure is up to scratch! because it causes neither emissions nor noise and is thus friendly to people and the environment. because cycling infrastructure is inexpensive in construction and maintenance: building a meter of bike path is six times cheaper than building a meter of road. In the end, all Frankfurters benefit from a high proportion of bicycle traffic! Moreover, due to its short distances and favourable topography, Frankfurt offers good conditions for cycling. Many people have already realised this and would like to cycle more. However, the share of journeys travelled by bike amounts to only 13% in Frankfurt. In comparison, in cities such as Amsterdam and Copenhagen this share is twice as high. of cyclists feel unsafe on the roads in mixed traffic. of the respondents want the government to construct more bike lanes. Experts for bicycle traffic agree that the wide-spread feeling of insecurity is the most important factor preventing more bicycle traffic. Cyclists only feel safe in bike lanes that are structurally separate from the rest of traffic. A cyclist in Copenhagen has an accident risk that is 13 times smaller than that of a cyclist in Frankfurt, while cyclists in Amsterdam have an accident risk that is 8 times smaller. The city of Copenhagen invests more than €35 per inhabitant per annum into its cycling infrastructure. The city of Amsterdam invests €11 per inhabitant. And Frankfurt? No more than €4.30. A better cycling infrastructure not only improves the sense of security, it also reduces the actual risk of accidents and thus encourages more people to travel by bicycle. to maintain and improve the quality of life in Frankfurt! Why support bicycle traffic at all? We believe that bicycles can be a great means of transportation for all Frankfurters – if the right infrastructure is in place. On the one hand, cycling is good for you: it is healthy and it is fun. On the other, cycling is also good for everybody else. Bikes take up less space on roads than cars, they do not produce any CO2 emissions, nitrogen oxides or particulate matter and they are very quiet. More bicycle traffic in Frankfurt is therefore good for everyone, not only for cyclists. 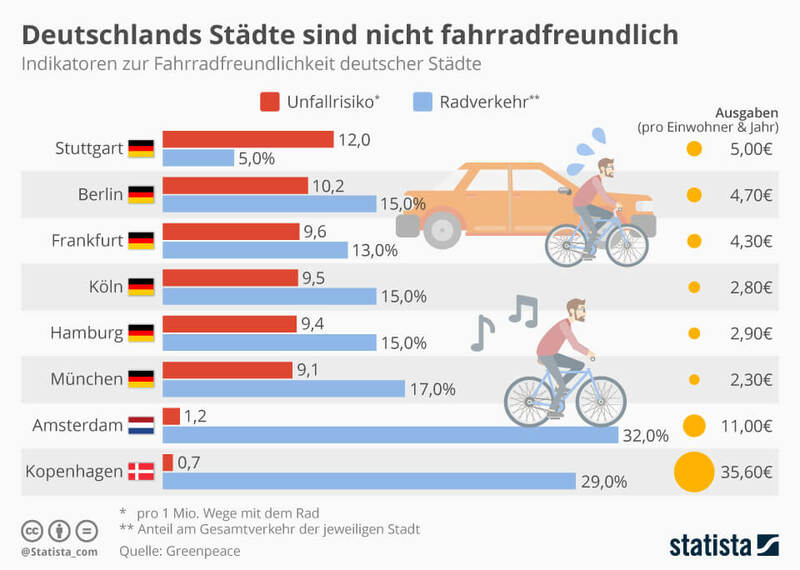 For these reasons we at Radentscheid Frankfurt (cycling referendum Frankfurt) believe the city of Frankfurt should do more to support bicycle traffic. Why should one means of transportation be preferred to the others (car, public transport, walking)? We do not want bikes to be privileged. We want all means of transportation to be supported in an appropriate and balanced manner, so that all Frankfurters are free to choose the right means of transportation for their particular purpose and route. Presently, the car is the most frequented means of transportation on the streets of Frankfurt: 61 % of all Personenkilometer (kilometres travelled multiplied by the number of transported persons, i.e. 2 people travelling 10 kilometres by car will have travelled 20 Personenkilometer) are currently being travelled by passengers in cars, whereas only 7 % can be attributed to cyclists. We want this to change. In our view, cars have been given preferential treatment in traffic planning in the last decades. We want to achieve a more balanced situation and that is why we believe that more support should be given to bike traffic. Forecasts assume that Frankfurt’s population will further grow, to up to 810,000 inhabitants in the year 2030. Most likely, the high number of commuters from the surrounding cities and towns will also increase. The commuting traffic accounts for approximately 57 % of kilometres driven by cars in Frankfurt. We believe that the bicycle can also play an important role as a means of transportation for commuters from outside of Frankfurt. We at Radentscheid believe that the traffic infrastructure in Frankfurt has already reached its limits, especially during the rush hour in the morning and evening. We fear that if even more people decide to use the car, the situation might become completely unbearable. A shift of traffic towards other means of transportation, including bicycles, but also public transportation and walking, will free up space in the streets and will thus make additional traffic manageable. The city is already committed to cycling: it has developed its mobility strategy and has established a bureau for cycling. Why do we need a referendum? It is true that the city is already committed to cycling. References to the promotion of cycling can be found in the climate protection project Masterplan 100% Klimaschutz and the concept for mobility strategy Mobilitätsstrategie Frankfurt am Main. The city also has a bureau for cycling (Radfahrbüro). However, there seems to be no rush. In our opinion these strategy papers have been followed by too little action. Although bike lanes are being built, we believe that the city of Frankfurt must become far more active regarding bicycle traffic and finally convert its ambitious targets into action. To achieve these goals, you also have to spend money. That is why we have initiated this petition for a referendum. We believe that this will create the necessary pressure on public authorities and the administration so that Frankfurt can actually become a cycling metropolis on the Main. Why are the bike lanes that you are demanding necessary? Cyclists can also use the streets. Many people are already cycling in Frankfurt, on the streets or on poor bike lanes. This is, however, no reason not to want to improve the situation for cyclists. Many people presently do not ride bikes because they do not feel safe on the road. According to a representative survey conducted by the federal ministry of transport (Bundesverkehrsministerium), 47 % of the participating cyclists feel unsafe in road traffic. In our opinion, this would change with a better infrastructure. The bus lanes that already exist in some places are no alternative either. Many people feel uncomfortable when they have to cycle in the same lane as large vehicles such as buses; the very different ways of driving of cyclists (in comparison slow but continuous) and buses (faster but with stops in-between) leads to a game of cat-and-mouse: at bus stops, cyclists overtake, just to be overtaken again by the bus. The many overtaking manoeuvres are dangerous. We believe that with a well-developed, wide and, where possible and necessary, structurally separate cycling infrastructure, many people who presently do not dare to cycle in city traffic would also start using bicycles. Cyclists are only a minority. Why should traffic planning be suited to your needs? Although cycling currently accounts for only approximately 13 % of the modal share in Frankfurt (the ‘modal share’ is the proportionate distribution of distances covered by the different means of transportation. It is an established method of statistics to compare mobility in different cities), this percentage has already doubled since 1998 and we assume that this development will continue further. We believe that cycling can become a mass phenomenon in our city as well, provided the right infrastructure is in place. In a representative survey conducted by the federal environment ministry, 79% of the respondents stated they would like more to be done for Ecomobility in their city (including support for the bicycle). We have witnessed the positive examples of other German cities such as Münster or Munich, where cycling is much more popular. What about people that can’t ride a bike? To ride a bike you have to be physically fit. Well developed, wide, and where possible and necessary, structurally separate bike lanes also allow physically handicapped people to cycle. Cycling also has many health benefits – so when an appropriate infrastructure is in place and more people dare to go by bike, they will be able to go increasingly longer distances by bike. For people who are dependent on cars due to physical disabilities, the necessary infrastructure remains in place, and we assume that driving will become easier because there will be fewer people on the roads going by car. Why do you want to reduce the space for cars on the roads? We don’t want less space for cars, but more for bicycles. In comparison, car drivers will also benefit, as bicycles take up far less space on the road than cars. The same holds true for parking spaces: the space required for one parking car can be used for 8 to 10 bicycles. So if the proportion of cyclists increases, this also means space for cars on the roads. What will happen to parking spaces along the streets? It cannot be completely avoided that, if we want to make more space available for bicycle traffic, there will be a reduction of lanes or parking spaces for cars. However, as bicycles take up far less space than cars, we believe that the available space will be utilised far better following a shift to more bicycle traffic. Thus, there will also be more room for people who want to drive, both on the road and in the parking spaces. In our opinion, roads and parking spaces are already often congested, and we fear that this situation will worsen due to the increasing population in Frankfurt, if the new Frankfurters decide to drive into town by car. We believe that only a shift in transport policy towards Ecomobility and an inclusion of bicycle traffic will prevent total gridlock. You cannot always take the bike; sometimes it’s just too far or you have to transport something that’s too large or too heavy. What am I supposed to do if I need a car occasionally? We do not claim that everyone should always go by bike. We want all Frankfurters to have the possibility of going by bike. That does not exclude the possibility of taking a car for large errands, family outings or for any other reason. We do not want to completely do away with cars or any other means of transportation. However, we believe that going by bike, walking or using public transport is good for our environment, is quieter, produces less pollution and saves space. This is positive for all Frankfurters. We think that, especially for short distances up to 5 km, the bike is often the best choice, because you are faster than on foot, you do not have to wait for the bus or train and can easily find a parking spot.. With a better developed infrastructure and an e-bike (Pedelec), this distance can be extended even further, which should be more than enough for most routes within Frankfurt. Won’t the additional bicycle traffic bother pedestrians and motorists? Even now, cyclists often disregard traffic rules. Without a doubt, cyclists should be in bike lanes – the pavement should be reserved for pedestrians. Cyclists often use the pavement nonetheless, because they are forced to do so by poor bike lanes and dangerous traffic. That is not an excuse, but it is an explanation. If the improved cycling infrastructure that we are calling for were in place, cyclists surely would make use of it. That is precisely why we are pressing for well-developed, wide and, wherever possible and necessary, structurally separate bicycle lanes. By no means do we want to support or encourage infringements of traffic rules. People who do not follow the rules endanger others and themselves – this applies to cyclists as well as to drivers and pedestrians. However, we believe that a suitable infrastructure also leads to greater compliance. Only if everybody sticks to the rules can traffic function properly. Won’t the additional bicycle traffic obstruct delivery vehicles? If more people travel by bicycle, this will relieve pressure on the infrastructure for cars. This also benefits delivery vehicles. If loading areas are systematically planned outside of bike lanes and driveways are designed to be safe, delivery vehicles and bicycle traffic can easily coexist. Added to this is the enormous potential for a shift within logistics towards freight bicycles. We believe that there is huge potential for delivery services using bicycles, especially for short distances. In many German cities, including Frankfurt, there are logistics companies that work with freight bicycles. In our opinion, these bikes have many advantages: they are more flexible, less expensive to maintain, often faster on short distances and take up less space. They will also benefit from the cycling infrastructure we are calling for. Won’t the retail sector lose customers if car traffic is reduced? Frankfurt’s most attractive shopping street is the Zeil, where there are almost no cars. Bicycle traffic causes less noise and pollution and can thus also increase the attractiveness of public spaces and therefore also the chance of walk-in customers for businesses. According to a study by the European Cyclists’ Federation, sales in local retailers throughout Germany would increase by around €8.7 billion if the modal share of cyclists doubled. How are these measures going to be financed? Our cost estimates are based on relevant benchmarks as well as the cost estimates of other Radentscheide (cycling referendum campaigns) in Germany. According to our estimates, the measures we are calling for would cost a total of around €13 million per year. That is €17.66 per citizen and year, about as much as a visit to the cinema including popcorn. The budget of the city of Frankfurt provides enormous sums for the maintenance and expansion of road infrastructure: for example, in 2017 approximately €23.8 million were budgeted for the maintenance of roads and bridges. Some of this is already being spent on cycling infrastructure, but, as we see it, not enough. We believe that, in the budget category 16 Nahverkehr und ÖPNV (local transport and public transit system), and especially in the subcategories 16.01 Erschließung (development) and 16.03 Verkehrsanlagen (traffic facilities), parts of the budget can be shifted from car traffic to bicycle traffic and thus finance the measures we are calling for. Another possibility for the city of Frankfurt to finance these measures is the expansion of parking space management. Furthermore, there are various direct spending programmes of the federal state of Hesse (e.g. via the Hessische Mobilitätsförderungsgesetz (the Hessian mobility promotion act)) and the federal government (e.g. Bundeswettbewerb Klimaschutz durch Radverkehr (federal competition for climate protection through cycling)) through which funds can be procured for construction work. Especially in view of the current discussion regarding driving bans for diesel vehicles, we believe our demands to be justified. Driving bans are not an end in themselves but have the purpose of complying with the pollution limits in city centres. We want to create opportunities, but we do not want to completely exclude any means of transport; we are therefore against driving bans. By shifting traffic to environmentally friendly bicycles, our demands would also help to comply with limits and thus avoid driving bans. In our opinion, investments in bike lanes and other forms of cycling infrastructure are also a sensible long-term investment that would benefit all Frankfurters. While spending money to enforce driving bans would improve air quality, it would otherwise mainly cause trouble: both for the affected motorists and for the city, which would have to enforce the ban. Stadt Frankfurt am Main (2017), pp. 1334+.